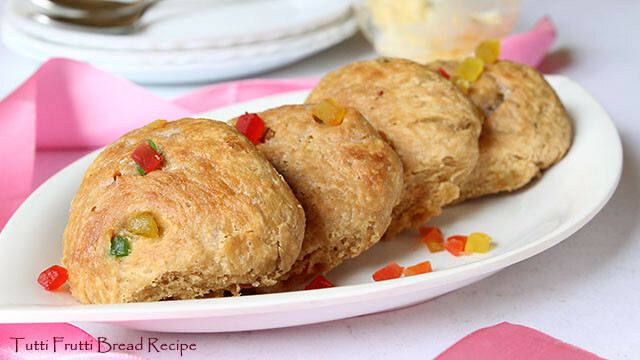 Mumbai Special Bun Pav Or Bread which is commonly known as Tutti frutti bread made with organic whole wheat flour. This bread recipe is so simple to make yet so delicious to taste. It is homemade hence healthy, hygienic and delicious than the ones you get outside. I relish Bun Maska in Irani Bakeries in Mumbai. So I decided to make one at home. My dad loves these buns so I made one for him. This is one of my old post which I have changed the pics with new ones. This Tutti Frutti Bread got over in jiffy minutes. Guess I have become perfect in making bread at home. I am enjoying my Tutti Frutti Bread with a hot cup of Chai with slice of cheese in my bread…. Yummy I am loving it. Also this bread is soft and moist. My dad loved the flavor and relished these Tutti Frutti Bread. I have used more whole wheat flour to make it healthier. You could also roll these breads into oats before baking them. For the extra nutrition. Making bread is no rocket science… yeah u cannot be impatient. Because you have to be patient while making bread. Otherwise your bread won’t turn out great. Lemme quickly share this recipe with you. If you love dessert then do check eggless tutti frutti cookies, eggless vanilla sponge cake, eggless banana cake, chocolate walnut cake, glutenfree marble cake and marzipan. Tutti Frutti Buns or bread recipe with butter (maska) a famous Mumbai food. Take yeast along with 4 tbsp lukewarm milk Or water, hot enough so that you are able to dip your finger. Add some salt along with honey. Keep covered in a humid place. I have used lukewarm water and used fresh yeast. within ten mins the yeast will become frothy. Stir with a spoon and keep it covered aside again. Sift wheat flour and refined flour together. Mix yeast, milk and oil with flour. Knead well to form a dough. Use all your stamina to knead this dough. After about 15 mins of kneading. Shape your dough into a round ball. The dough would be slightly sticky yet. You could add little bit of flour into it. But caution don’t be tempted to add more flour. Else your bread or bun would be rubbery. Slightly oil a vessel. Place this dough into this vessel. Cover the dough with a damp towel or cloth. Keep it aside in a humid place. Approximately after 30 mins the dough should rise up to its double size. Now again dust a little flour and knead this dough again. The more you knead the better would be your bread. So don’t be lazy in kneading dough. Add tutti frutti into the dough. Give desired shape. I have divided the dough into two parts ⅔rd have placed into bread box. 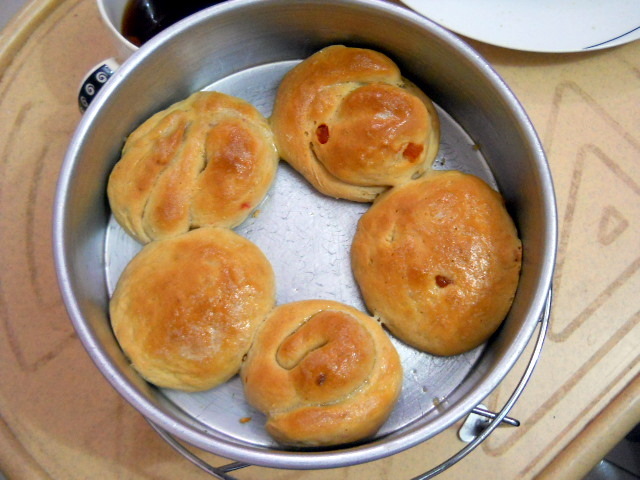 The rest dough have shaped them into round buns. Keep 2 inches space between these balls. Again apply the same process for about 30 mins cover these shaped balls with damp cloth. After 30 mins they will double up and rise beautifully. Bake them at 220°C for about 30 mins Or when they become nice brown. Please don’t over bake them unless you want rubbery bread. I can assure your bread and bun would look beautiful. Brush some butter on them for a nice glaze. 1. You could use olive oil or butter instead of coconut oil. 2. Don’t make the flour very firm while kneading. The dough should be soft, smooth and slightly sticky Kindly refrain from adding more flour while kneading. If it is too sticky you could add few more drops of oil. 3. Instead of wheat flour you could use refined flour, Corn flour. Replace with wheat flour and follow the same instruction as above. 4. It is important to use fresh yeast. If your yeast is not getting frothy in 7 mins, that means it is spoiled. Kindly discard this yeast and replace with fresh yeast. Otherwise your entire effort will go in vain. 5.You could use only refined flour instead of wheat flour. In ur receipts u mention sift wheat flour n refined flour, how much refined flour u hunt mention. Pls let me know ,I want to make this yummy buns. You could take whole wheat flour and refined flour of 1 cup each that is 1:1 proportion. I haven’t used refined flour hence didn’t mention the proportion. Do try Asha and let us know how they were? thankyou. Zita yes just take 200 ml cream, add sugar, 1 cup milk grind all until smooth. Now add tutti frutti candies mix well. Freeze and cover with a foil. Once firm your icecream is ready. This is a instant icecream hope helps you.